Vote for ONCOSTEM here: Duke Start-Up Challenge Facebook Page. summary paragraph: describe what problem you are solving, how many people are experiencing the problem, and what your solution is. Although the huge R&D investment observed in the past years in the development of new treatments, there is still lack on an effective treatment in many tumor types. In particular, the median survival for glioblastoma multiforme (GBM), a high-grade brain tumor affecting 23,000 patients a year in US and EU, is 14 months and its 5-yr survival less than 5%. It is therefore urgent to develop more effective treatments against these fatal diseases. 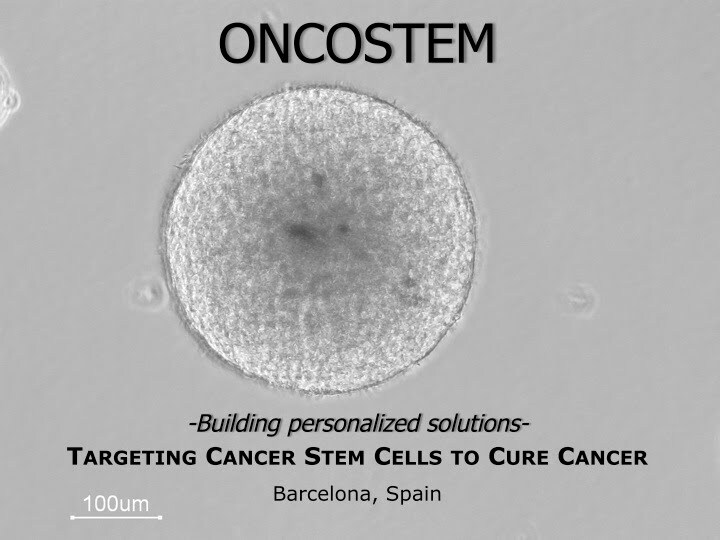 ONCOSTEM is an spin-off of Prof. Seoane group at The Vall d'Hebron Institut of Oncology (VHIO) in Barcelona (Spain) focused on the development of new and innovative treatments targeting cancer stem cells (CSC). It has been recently demonstrated that CSCs are responsible from tumor initiation, maintenance, relapse and resistance to radio- and chemotherapy, and therefore targeting CSC will result in more effective therapies. Our technical platform, a cancer patient-derived mice model reproducing the patient’s tumor has already proved successful in identifying the “X” (real name omitted from the public document) pathway as critical in the CSC biology. The project presented here entails the pre-clinical development of the lead ONCOSTEM product, the anti-X antibody, which has shown in vitro and in vivo activity in GBM. ONCOSTEM will generate, after an investment of $4.5M, a fully humanized antibody, active in vivo and vitro against GBM and ready to enter clinical trials. The anti-X antibody is only the first product derived from a complete and competitive technological platform comprising a unique mice model and the genomics expertise able to develop a pipeline of innovative therapies and diagnostic tools to target CSCs. Global cancer prevalence rates are on the rise owing to an aging population and changing lifestyle. Despite the huge investments in R&D for the development of new therapies, there is still a high unmet need for improved treatments for multiple types of cancer. As a consequence, oncology has become one of the major focus areas for pharmaceutical and biotechnology companies. In 2010, the global cancer market was valued in $54bn ($36bn captured by US and the Top5 EU countries) and the forecasts expect the global market expanding at a CAGR of 6.9% from 2010-16, reaching $81bn in 2016. Gliomas, the first indication pursued for ONCOSTEM’s anti-X antibody, are the most frequent tumors of the brain with 176,000 new cases every year worldwide and a 60% mortality in 2010. Gliomas can be divided into four clinical grades on the basis of their histology and prognosis and grade IV gliomas (glioblastoma multiforme, GBM) is one of the most malignant human tumors affecting 23,000 patients a year in US and EU. GBMs are highly malignant tumors, usually recalcitrant to radio-and chemotherapy and have a median survival of 14 months and only a 5% 5-yr patient survival. GBMs are extremely invasive resulting in the inability of surgery to completely cure patients, resulting in an almost 100% probability of disease recurrence. Radiation therapy improves overall survival for each tumor grade, yet no patients are cured by this treatment modality. Concurrent treatment of Temodar® with radiation improves the median survival by 2.5 months compared with radiation therapy alone. Thus, Temodar® has become a standard adjuvant therapy for gliomas although it offers modest clinical benefit with an annual revenue superior to $1bn. Novel molecular-targeted therapies against these devastating tumors are urgently needed. Many different compounds have been tested as anti-glioma agents during the last 10 years with barely any success. Among many different reasons, the intratumoral heterogeneity observed in brain tumors make them especially recalcitrant to treatment. Among the different cell subpopulations present in a tumor, cancer stem cells (CSC) are the most malignant being responsible for recurrence and therapeutic resistance of the tumor. Therefore, therapeutic agents eliminating of CSC should lead to eradication of the tumor (Exhibit 1). Unfortunately, few pharmacological compounds have been described to target cancer stem cells to date. Our aim is to generate pharmacological compounds targeting CSC, in order to address the need to develop innovative cancer treatments to more efficiently treat these patients. Around 40,000 patients are diagnosed with glioma every year in US and EU. During the past few years the incidence of brain cancer has been relatively constant and dramatic changes are not anticipated in the future, therefore expecting a stable patient population in the next years. The market opportunity for the anti-X antibody is calculated based on the patient size for its leading indication, grade IV glioma or GBM that comprises a total of 23,000 patients in 2010 (10,000 in US and 13,000 in EU). These two locations are the most important markets for innovative treatments and in addition, the patents covering the anti-X antibody are currently under review in the aforementioned locations. Approximately 70% of the GBM patients follow the standard of care (SOC) consisting in the Temodar® treatment after surgery and radiotherapy. Also, 19% of the patients follow Avastin® treatment alone or in combination with other chemotherapeutic agents (second line treatment). Approximately 60% of GBM patients treated with Temodar® experience tumor progression within one year and approximately 48% of patients who are diagnosed with GBM will fail both front-line therapy and Avastin®. Experiments estimate that approximately 60% of the GBMs have X expression and therefore are candidates to be treated with the therapeutic antibody after Temozolamide or Avastin failure. Under these assumptions, our target patient population comprising those patients that have not responded to 1st and 2nd line treatments in US and EU, would be approximately 11,000 patients a year. Taking as a benchmark Avastin’s price in US ($80,000), also a therapeutic antibody recently approved for glioblastoma treatment, we estimate that the anti-X antibody may reach a potential peak revenues of $530M (Exhibit 2). One additional factor that plays a major role in the growth of the cancer therapy market is the expansion of target indications. Most of the blockbuster drugs were launched for a narrow indication, and were later approved for other indications. A classic example is imatinib, which was first approved by the FDA in 2001 for the treatment of CML, and later expanded to nine different indications. It has also been observed that X is expressed in other tumor types such as lung, bladder, ovarian, gastric, breast cancers and myeloma. We consider that CSCs may also play critical role in these tumors, and that the anti-X antibody would be a beneficial treatment for these patients. Therefore, line extensions in these additional cancer indications would be pursued after the anti-X antibody approval for GBM. Additional indications will allow for increased revenues and profits especially due to the fact that the development costs and time requirements for line extensions are smaller. There is a clear interest from all the stakeholders in the development and commercialization of new cancer treatments. Oncology represents one of the health areas with larger unmeet clinical needs due to the continuous increase in cancer prevalence worldwide. As a consequence, pharmaceutical and biotechnological companies are investing enormous resources in the development of new therapies, generating an expected global cancer market CAGR of 6.9% for 2010-16. Glioma, with a median survival of only 14 months, is one of the solid tumors with an efficient treatment still lacking. As seen in exhibit 3, after the analysis of 26 different oncologic indications, brain tumors is the 5th indication with more potential treatments under development, only after breast, NSCLC, prostate and colorectal cancers, indications with much higher incidence than brain tumors (1.5 million new breast cancer patients a year; 176,000 new glioma patients a year). In addition, oncologists are closely involved in the clinical trials required for the approval of new and more efficient treatments for their patients and the patients are willing to find a better cure for their disease, either at the expense of high premium prices. 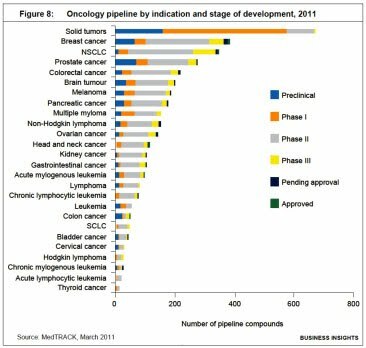 Taking all together, in a period in which big pharmaceutical companies are seeing how their pipelines are shrinking, it is frequent to see acquisitions and co-development agreements with smaller biotechs developing new promising treatments in cancer. Tumors are formed by different cell types with diverse characteristics and therefore, tumors are heterogeneous. Cells within a tumor differ in their rate of proliferation, state of differentiation, motility, etc…Importantly, tumor cells also differ in their sensitivity to treatments implying that some cells within a tumor will be more resistant than others to treatment. Among this heterogeneity, the called cancer stem cells (CSC) are considered to be responsible for the initiation, recurrence and chemo- and radio-resistance of tumors. Prof. Seoane’s group has been working in generating tools to identify CSC in patient-derived GBM, studying the molecular mechanisms involved in CSC biology, and designing novel therapeutic approaches to target cancer stem cells. In fact, Prof. Seoane has evolved a key opinion leader in CSC research and his team, a reference laboratory worldwide publishing in the most renowned peer-review scientific publications worldwide (Bruna et al. Cancer Cell 2007, Peñuelas et al. Cancer Cell 2009, Anido et al. Cancer Cell 2010). 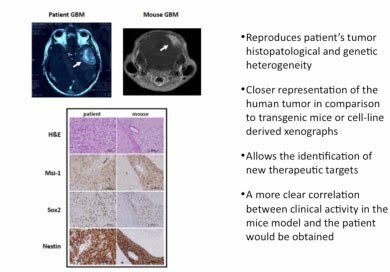 In particular, Prof. Seoane’s laboratory has developed an animal model based on patient-derived tumor samples obtained from the hospital (Exhibit 4), which recapitulates the heterogeneity present in patients (Exhibit 5) and that is without any doubt at the cutting edge on GBM research. ONCOSTEM will use this technological platform for the development of new therapeutic agents targeting CSCs. Much of the research that has been developed in the field of molecular oncology is based on the study of established cell lines. Cells from established cell lines have undergone many passages and have been maintained for many years in artificial conditions diverging from the original tumor cells. Moreover transgenic animals generate tumors that less heterogeneous than human tumors and usually differ in the oncogenic mutations present in human tumors. It is clear from several studies that cell lines do not faithfully recapitulate the genotype and phenotype of real tumors. Our studies are not based on the study of established cell lines or transgenic animals but on a patient-derived tumor model. The tumor samples were obtained at Vall d’Hebron hospital within 15 minutes after surgery and cell populations from the tumor such as the cancer stem-cell-like pool were isolated. The study of those cells gives us more reliable information about the original tumor than the study of established cell lines since they maintain the same molecular profile as the original human tumor. Moreover, cancer stem-cell-like cells are orthotopically inoculated in the brain of mice to generate tumors that recapitulate the characteristics of the original human tumor (Exhibits 4 and 5). 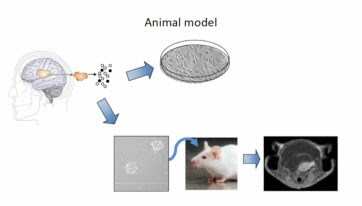 This provides an optimal in vivo model highly relevant for preclinical where the intrinsic heterogeneity of human tumors is reproduced. In addition, this model has been critical for the understanding of the cancer stem cell biology and may lead to the development of more effective therapies for cancer. As a first example of the relevance of this mouse model in the development of critical therapeutic targets for CSC, the cytokine X has been identified as a crucial factor in the control of the differentiation and survival of cancer stem cells. In addition glioma patients with X overexpression present a significant smaller probability of survival. A monoclonal antibody against X has been generated in the laboratory of Prof. Seoane and the mAb has been proved effective against cancer stem cells both in vitro and in vivo. We acknowledge that the brain-blood barrier (BBB) is one of the main challenges for brain tumor treatment. However, in brain tumors, the BBB is broken at the core of the tumor and Avastin, a humanized antibody recently approved for GBM treatment, is the demonstration that therapeutic antibodies are effective agents for glioma treatment. At ONCOSTEM, we recognize the heterogeneity that also exist among patients, and that has been one on the main causes for drug failure during the last years. For this reason at ONCOSTEM we believe that a robust diagnostic tests should complement each new therapeutic agent in order to give each patient a tailored and personalized treatment meeting the characteristics of his/her tumor. In addition, EU and US regulatory organisms have indicated that targeted drugs will not be approved in the absence of available, relevant diagnostic tests. At ONCOSTEM we are committed to give each patient the right treatment, and we already have a marker to identify those patients that could benefit from the anti-X antibody. Moreover, ONCOSTEM will leverage its experience in cancer genomics (ultrasequentiation, microarray analysis) and histopathology to develop markers and companion diagnostics for the products in our pipeline. In addition, we want to identify the presence of CSC in patients to determine its correlation with prognosis, recurrence and metastasis. This diagnostic platform may also be a service-based potential revenue stream for ONCOSTEM and we are open to further explore this model. Overall, ONCOSTEM is a complete and competitive technological platform comprising a unique mice model and the genomics expertise able to develop a pipeline of innovative therapies and diagnostic tools to target CSCs. The anti-X antibody is only the first example of this promising platform. The development plan for the anti-X antibody presented in this idea summary only encompasses the pre-clinical development of the anti-X antibody. In addition, ONCOSTEM will focus on development stages comprising from the pre-clinical stage to Phase I clinical trials (and exceptionally Phase II). As with all drugs, product quality of the anti-X antibody and other potential future therapeutic agents, an appropriate preclinical pharmacology-toxicology testing program, and well-designed clinical trials are essential for a successful drug development program. To secure that the products meet the requirements we will partner with experienced CRO (Contract Research Organizations) for the antibody humanization (Fusion antibodies), the toxicology assessment and the antibody manufacturing (Covance and Charles River). These CROs have regulatory affairs experts specialized in drug development that will ensure that the processes performed comply with the EMA and FDA regulations. In addition, VHIO, the Vall d'Hebron Hospital and the Massachusetts General Cancer Center are international reference centers for clinical trials specifically in solid tumors including brain tumors. Thus, the experience of our co-founders in the development of clinical trials at these centers will be a key strategic value when approaching the design of clinical trials for ONCOSTEM pipeline drugs. Finally, we want to mention some of the regulatory advantages associated to the development of the anti-X antibody. Antibodies, such the anti-X antibody, have higher probabilities of success in the clinical development process in comparison with small molecules due to their higher specificity and lower toxicity profile. In addition, the combination of the debilitative nature of the brain cancer disease, comparatively low incidence rates (less than 200,000/year) and the lack of a definitive cure, allows us to believe that securing Orphan Disease status and/or and a “Accelerated Approval and Priority Review” (Fast Track) by the FDA are feasible. This status will allow ONCOSTEM or the company licensing the anti-X antibody to recoup the large R&D investments (through tax breaks, research grants and marketing exclusivity periods), and a shorter development and approval process that will ensure that the development of the therapy is profitable. An example of a therapeutic agent that has received this status is the humanized monoclonal antibody against VEGF, Avastin®. On the basis of high radiographic response rates and a modest toxicity profile, the FDA has granted accelerated approval for the use of Avastin® in the treatment of recurrent GBM. 2.PCT/EP2011/055XXX: Protects anti-X antibody both as a therapeutic agent and as a diagnostic tool. Countries covered: US, EU and other main markets. Filed in 2010. ONCOSTEM authors: Dr. Anido and Prof. Seoane. In order to manage the IP related to the anti-X antibody, the renowned European intellectual property management firm Hoffman Eitle is leading the patent awarding process. In addition, patents protecting additional therapeutic targets and technology are being developed at Dr.Seoane’s laboratory, which can be future licensing targets for ONCOSTEM in order to develop its pipeline. As showed in the development plan below (Exhibit 6), during the next 3 years we will complete the preclinical development of our lead compound, the anti-X antibody. The final product at the end of the 3 years will be a monoclonal antibody with therapeutic properties against glioblastoma. We will have the results of its activity evaluation in vitro and in vivo, as well as, data about its toxicology. With all this in hand, we will have a compound with a good market expectative in the field of glioblastoma, ready to enter clinical trials and be further developed into the market. To complete this development plan, our company ONCOSTEM is seeking to raise $4.5M. In order to complete the 3-year development plan, we are seeking to raise $4.5M (see Exhibit 6 and milestones for details). At this point we will reach the next step of the company comprising an additional round of financing or a possible exit if the technology is licensed or the company acquired . We want to mention that Dr.Seoane’s laboratory has been awarded (ranked top 2) the research grant “Prova’t” from the Catalan government. This grant is devoted to the development of prototypes and to the increase in valorization and transfer of R&D results. The $400,000 award will cover part of the costs associated to the anti-X antibody humanization and the toxicology assessment (Exhibit 6). 1.-Enter in a round B financing to perform the phase I clinical trial . VHIO and the Vall d'Hebron Hospital are international renowned centers for clinical trials specifically in solid tumors including brain tumors. Our team’s expertise and collaborations with the Vall d’Hebron Hospital will be strategic on the success of the study. 2.-Co-development partnership with a Biopharma company. We will identify and approach biopharma companies with complementary pipelines in oncology that would be interested in collaborating with us in the in the further development of the product such as AVEO Pharmaceuticals, Genentech or Eli Lilly. The members of our team have developed long-lasting collaborative relationships with these companies and this would facilitate the initial contact with them. 3.-License the anti-X antibody to a Biopharma company/Company acquisition. The anti-X antibody has generated great interest by biotech and pharmaceutical companies and our team has two informal offers for licensing the product to two biotech companies. Therefore, we anticipate and increased interest for the anti-X antibody once the development plan is successfully executed opening new opportunities for licensing. As ONCOSTEM advances its pipeline development to the value creating milestones and demonstrates the value of the technical platform we assume similar exit and financing opportunities to comparable firms. Our team has state of the art scientific, preclinical and clinical expertise. We are worldwide recognized professionals in CSC biology and personalized medicine at the pre-clinical and clinical level with a successful track-record and top peer-reviewed publications. In addition, all the team members have demonstrated management experience. 1. Negotiation with the VHIO and licensing of the patents protecting the technology. To this end we have already contacted the foremost global legal firm in Spain and Portugal, Garrigues. Dulce Miranda, partner at Garrigues specialist in intellectual property litigation, contracts relating to intellectual property rights and pharmaceutical and biotechnology law, will be the person leading the negotiations. We have also contacted the VHIO, and they are positive regarding the launch of the company ONCOSTEM and the starting of the licensing negotiations. COST: $3,300 (for the licensing document developed by Garrigues) + an undefined amount for the technology licensing agreement. Comparable deals in similar Biopharmaceutical start-ups go from only equity to an upfront payment ($1-$0.5M) + milestones + royalties (single middle digit range). If there is some cash not needed to cover these objectives, the balance would be used as a cash reserve to cover potential unexpected development costs. ONCOSTEM’s objective is to bring our cutting-edge scientific and clinical knowledge closer to the patient in order to improve life expectancy and quality for those suffering brain-related diseases and other cancers. Recognizing the uniqueness of each patient and the complexity of their tumor is the first step to fight and eradicate their disease. For our team, the Duke Start-up Challenge would be a perfect opportunity to test the viability of our dream and improve it.